Darren Dreger of TSN is reporting that the Edmonton Oilers have decided the price is no longer too high on Tobias Rieder, and will sign the free agent forward to a one-year contract worth $2MM. Rieder did not receive a qualifying offer from the Los Angeles Kings and became an unrestricted free agent. The deal is the optimal “prove it” contract as the Oilers aren’t risking more that $2MM to see if they can get him to have a breakout season and if it fails, they can move on with no repercussions. With Rieder’s speed, he might be a solid fit next to Connor McDavid or Leon Draisaitl on one of the top two lines. If he is a success, then Edmonton still gets his restricted free agent rights next season, so they can keep him in the fold. And at age 25, he’s still has potential to improve his game and fit in well with the younger core of Oilers. He also has some penalty killing experience, which can’t hurt an Edmonton team that struggled with special teams last season. The speedy winger has always had a tremendous amount of potential and looked to be well on his way after his first three years in Arizona in which he tallied 13, 14 and 16 goals. However, he fell out of favor with Rick Tocchet and the team opted instead to send him and goaltender Scott Wedgewood to Los Angeles for backup goalie Darcy Kuemper. Rieder posted four goals and six points in 20 games after the trade, but it wasn’t enough for the Kings to give him an qualifying offer. The Blue Jackets have reached out to representatives for winger James van Riemsdyk during this week’s interview period, notes Aaron Portzline of The Athletic (Twitter link). However, it appears that they’re not going to be able to land the 29-year-old. He’s coming off of a career year in goals with 36 despite playing less than 15 minutes per game and has scored at least 27 goals in four of the last five seasons. (The one year he didn’t was one where he had injury troubles but scored at a 29-goal pace.) Meanwhile, TSN’s Frank Seravalli reports that there are eight teams still in the mix for van Riemsdyk but that his previous team, Toronto, is not believed to be among them. The Canucks spoke with winger Tobias Rieder’s agent today, reports Sportsnet 650’s Rick Dhaliwal (via Twitter). The two sides are expected to speak later as well. Rieder went unqualified by the Kings on Monday and he has interest from roughly half a dozen teams around the league. There appears to be mutual interest between the Oilers and winger Jason Chimera, reports TSN’s Ryan Rishaug (Twitter link). The 39-year-old is from Edmonton and with the team having limited cap space this summer, they’re going to be shopping for bargain deals. Chimera is coming off of a quiet year split between the Islanders and Ducks where he scored just three times but he put up 20 goals in each of the previous two seasons. Center Kyle Brodziak is expected to narrow his list of teams he’s considering down to three later today, Sportsnet’s Mark Spector tweets. He adds the Oilers could very well be the favorite to land him which bring things full circle for the 34-year-old, who was drafted in the seventh round by Edmonton back in 2003. Brodziak is coming off his best offensive performance (33 points) since 2011-12. Vegas has yet to make defenseman Luca Sbisa an offer, his agent told Pierre LeBrun of TSN and The Athletic (Twitter link). He had an injury-riddled campaign that saw him play in just 30 regular season games although he still managed to put up 14 points, his highest total in six years. He was a regular for the most part during the Golden Knights’ run to the Stanley Cup Final but it appears he will be playing elsewhere in 2018-19. 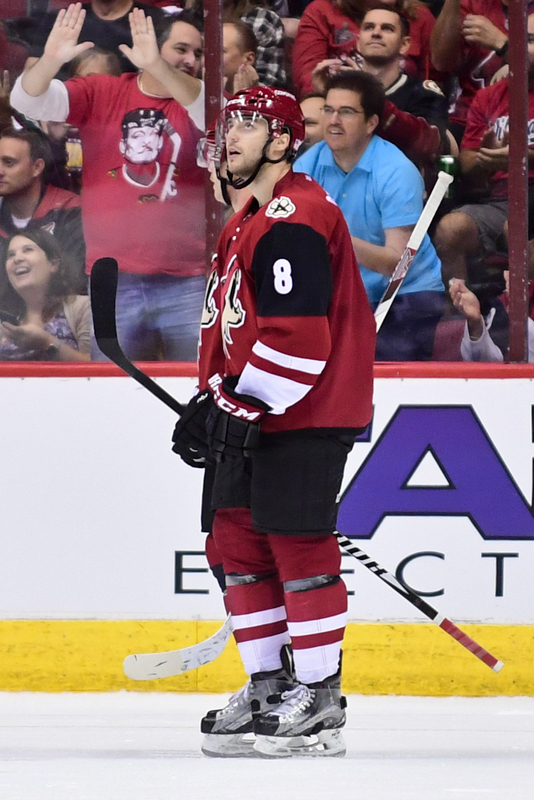 Rieder was acquired from the Coyotes back in February as part of the return for backup goalie Darcy Kuemper. However, he wasn’t particularly productive with his new team, posting just four goals and two assists in 20 regular season games while being held off the scoresheet in four postseason contests. Looked at on its own, that type of production doesn’t justify a qualifying offer. However, the 25-year-old has been more productive with Arizona previously. While he wound up with just 25 points in 2017-18, he tallied 37 points back in 2015-16 and 34 in 2016-17. Players with those types of numbers are worth that type of money which complicates things. Was this past season a blip on the radar with an expectation that he’ll return to his previous form or a sign of things to come? What Blake and the Kings ultimately decide to do will indicate which of those they believe to be true. Even if they don’t qualify Rieder, that doesn’t necessarily mean that he won’t be back next season. It is becoming an increasingly common practice for teams to non-tender arbitration-eligible players and then try to negotiate a new deal at a lower salary which is an avenue they could certainly consider. If they are leaning towards going in that direction, it wouldn’t be surprising to see the team try to shop him to see if someone else wants him first. With the qualifying offer deadline now just a few days away, Rieder’s case is certainly one of the more intriguing ones left to watch for. The Kings and Coyotes have made a trade as Los Angeles has acquired winger Tobias Rieder and goaltender Scott Wedgewood from Arizona in exchange for goaltender Darcy Kuemper. Both teams have announced the swap. Rieder has struggled this season under new bench boss Rick Tocchet and as a result, he is on pace for the lowest goal total of his career after tallying just eight through 58 games this season. However, the Kings would certainly have cause for optimism that he could bounce back as the 25-year-old has surpassed the 30-point mark in each of the last two seasons. Rieder is set to be a restricted free agent this summer and currently carries a $2.25MM cap hit and a $2.45MM salary; that amount will serve as his qualifying offer in June. The Coyotes are retaining 15% of that contract, per TSN’s Bob McKenzie (Twitter link). Los Angeles GM Rob Blake has been looking to add to the roster without losing any of his top draft picks and prospects and this deal accomplishes that, similar to the Dion Phaneuf swap with Ottawa last week. Rieder slots in as a versatile middle-six winger that can not only play both special teams units but he can also play on both the left and right side. This is Kuemper’s first season out of the Minnesota organization and to say he has thrived would be an understatement. In 19 games with the Kings this season (15 starts), he has compiled a 10-1-3 record with a 2.10 GAA and a .932 SV%. He’s making just the league minimum of $650K this season and will earn considerably more than that on his next deal as McKenzie reports (via Twitter) that he will receive $3.7MM on a two-year contract extension with Arizona for an AAV of $1.85MM. The trade and subsequent new deal for Kuemper gives the Coyotes a little bit more certainty when it comes to the goaltending position with starting netminder Antti Raanta slated to become an unrestricted free agent in July. Raanta, when healthy, has played quite well for Arizona with a 2.45 GAA and a .924 SV% in 35 games which should have in line for a considerable raise on the $1MM he is receiving this season. The Finnish netminder is set to be an unrestricted free agent in July. Craig Morgan of Arizona Sports adds (Twitter link) that the team still intends to try to re-sign Raanta. Wedgewood was in his first season with Arizona after being acquired from New Jersey back in late October. He has compiled a 3.45 GAA and a .893 SV% in 20 contests this season. The 25-year-old is also making the league minimum this season and is eligible for restricted free agency with arbitration rights this summer. Sportsnet’s Elliotte Friedman was first to report (Twitter link) that a deal between the two sides was close and that a Kuemper extension was likely. To no one’s surprise, Garrioch states that the floundering Arizona Coyotes are “willing to talk about pretty much every player on their roster”. That of course doesn’t include Calder-hopeful Clayton Keller or many of their other 21-and-under starters, but the rest of the roster may as well be up for grabs. The big off-season acquisitions of Derek Stepan, Antti Raanta, Niklas Hjalmarsson, and Jason Demers have done nothing to change this team’s ability to win hockey games. At some point, GM John Chayka is going to go from “up-and-coming” to “up-and-went” and that pressure could force him to make some major moves as he rethinks his rebuild. While impending UFA’s like Raanta, Brad Richardson, and Luke Schenn would be the easiest pieces to move, the stakes are high for a Coyotes team whose core has done next to nothing for years and key pieces like Oliver Ekman-Larsson, Max Domi, Anthony Duclair, and Tobias Rieder could soon be on their way out. Perhaps the only team more disappointing than Arizona in 2017-18 is the farthest team from them across North America: the Montreal Canadiens. Under new head coach Claude Julien, the Habs have fallen apart. However, the newly-signed coach isn’t going anywhere, putting GM Marc Bergevin, who Garrioch calls ” the NHL’s most active GM”, on the hot seat. Bergevin may be willing to make a big move to save his job, and of course the first name that comes to mind is young forward Alex Galchenyuk, who has predictably struggled under the defense-first Julien. Galchenyuk seems lost in Montreal, without an identifiable position, role, or spot in the lineup, and could use a change of scenery. However, he is not wholly to blame for the Canadiens’ struggles. Tomas Plekanec has long been on the block and if the team truly commits to a rebuild, big names like Max Pacioretty, Shea Weber, and (if anyone is willing to take on his monstrous new contract) even Carey Price could soon join the list. Garrioch mentions both the Winnipeg Jets and New York Islanders as possible sellers, but given the surprising success of both clubs thus far, neither is likely rushing to trade pieces away unless they can make their teams better this season. Impending Jets UFA’s Shawn Matthias and Matt Hendricks may draw interest, but if Winnipeg is in playoff position come deadline time, they would want veteran depth for themselves. It seems more likely that GM Kevin Cheveldayoff could use his overflow of young forwards like Marko Dano, Joel Armia, Andrew Copp, Adam Lowry, or Brandon Tanev as trade bait to bring in another top-six forward for a team that doesn’t shoot the puck nearly enough. As for the Islanders, Garrioch singles out first-time UFA Calvin de Haan as the player to watch. Yet, de Haan is one of, if not the best shot-blocker in the NHL, can play major minutes, and is reliable in both ends. If the Isles can resign him, wouldn’t they? Obviously, John Tavares is the main focus and the team thinks highly of younger options like Adam Pelech and Ryan Pulock, but the loss of a player like de Haan, especially with Travis Hamonic now in Calgary, could cripple a playoff-bound Islanders squad. Odds are de Haan sticks around, at least as long as New York remains playoff-bound. So who’s looking? Garrioch mentions the Florida Panthers, Calgary Flames, Columbus Blue Jackets, and the two-time defending Stanley Cup champion Pittsburgh Penguins as suitors for forward help, with the Dallas Stars potentially looking to make another big blue line trade to turn their season around. With that many buyers and several disappointed sellers, the trade NHL trade market may not wait until 2018 to heat up.